Your donation to the Friends helps the Library! E-books, audiobooks, music and more! We love our Friends! 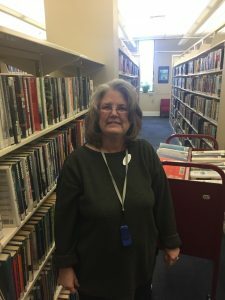 This non-profit group is dedicated to supporting and advocating for the Augusta County Library. If you’d like to make a donation to the Friends, then click the button below! The Friends of the Augusta County Library was founded in 1978 as a charitable arm of the public library in Augusta County, Virginia. We raise money to support the needs of the Augusta County Library system, providing critical resources and programs that are not funded by state or local tax dollars. We also provide volunteers who supplement the library’s staff and provide ongoing services such as landscaping. We are membership-based organization with members supporting the library by paying dues, volunteering in the library, serving on committees, and assisting with fundraising activities. Officers are elected annually from the membership to oversee organizational activities. Anyone is welcome to join the Friends and help support our wonderful public library. Meet our March 2019 Volunteer of the Month!